However the original Tender SURE and the other versions thereafter like the BBMP version of TenderSURE 'Lite' one and also the one on church street seems to have a premise which is based on a emotion like FEAR! The fear that the carriageway is sacred than anything and needs to be left untouched, so that the motor vehicles plying on them never feel a bump of any type. So the design made sure that all other reasons why there would be any intervention on the carriageway is made away with. Hence all the utilities are nicely tucked away under the footpath instead. 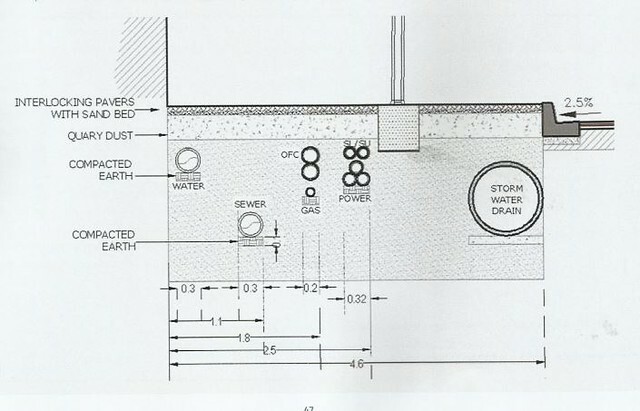 Below is the extract of the footpath crosssection from the original tendersure document..
On the outset that seems ok, but there there are a couple of things that get affected this way. About the first point, a question actually comes up about democracy, are we all really equal? Tender SURE doesnt seem to think so, since the design is to make sure that the motor vehicle drivers are more important than the ones using their own two feet! About trees, Bangalore has tropical climate and the heat does get really bad and with no trees on the street makes it that much harder for NMT to use the footpath effieciently. 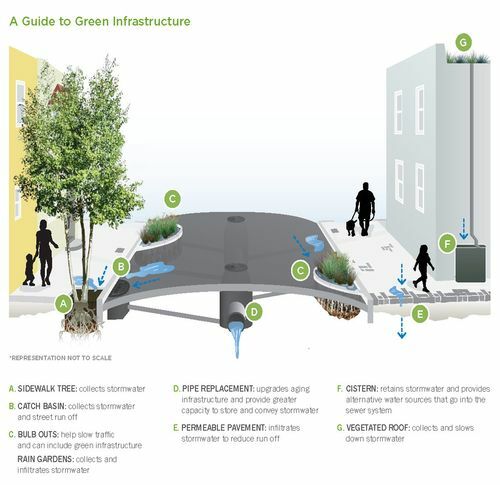 Hence planning for trees makes it very important to make the streets inclusive. There are various ways it can be achieved, if not moving other utilities under the road, we can atleast move the storm water drain underneath the road. This is because it makes it easier to plant trees on the footpath and also the problem of handling a lot of rain water that Bengalore receives every year. When it comes to planting trees, root barriers/directors should be of help to manage safe growth of trees.